MoCo is a fully passive monitor controller that helps you to provide perfect control over the playback volume of your studio monitors. "Fully passive" means that there are no active components involved, that could in any way alter the audio signal - keeping the maximum sound quality level for your studio monitors. 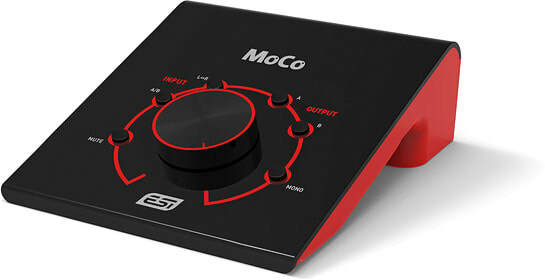 MoCo provides two separate stereo inputs (one with balanced 1/4" TRS connectors, one with both unbalanced RCA and unbalanced 1/8" TRS connectors) and two separate stereo outputs (one with balanced XLR connectors, one with balanced / unbalanced 1/4" TRS plus unbalanced 1/8" TRS connectors). MoCo does not change your signals from unbalanced to balanced: what goes in, goes out! Via one switch you can select the input signal and with separate buttons, each output can be enabled. Also there is a switch that changes the monitor signal to mono and you can mute the playback audio signal quickly at the touch of a button. A quick swap of the left and right audio signal channels is also possible. And of course, the stylish big knob in the center of MoCo controls the actual playback volume. © 2019 Eleven Dimensions Media, LLC. All rights reserved.